Turning Vanes: Necessary Component, or Efficiency Reduction Device? The installation of turning vanes in HVAC ductwork is perhaps one of the greatest sources of contention between mechanical contractors and HVAC engineers. Why? Because many mechanical contractors believe that turning vanes can cause the ductwork to become less efficient by increasing the pressure drop in the system, as well as adding time and expense to the overall installation. This belief seems to be based in simple logic: when there is more surface area exposed to the airflow, the amount of friction will be increased, and the harder the fan must work to achieve the required airflows. In some cases when an HVAC system is having particular difficulty in supplying the required amounts of airflow to all zones, many mechanical contractors will recommend the removal of every other turning vane at each fitting in the system in order to “reduce the friction” in the duct. This practice is a violation of SMACNA® turning vane spacing requirements, and has also been condemned by the Air Conditioning Contractors of America, because it decreases the uniformity of the airflow and increases the pressure drop in the system). The question is, does reality match up with popular belief? When airflow changes direction in a duct that lacks turning vanes, the walls of the duct must absorb the sudden impact of the air in order to reorient the airflow to the direction desired. Turning vanes assist the airflow in making a smoother and more gradual change in direction, resulting in less of an impact, and thus less force transferred (as airflow velocity increases, this effect becomes more pronounced). While the turning vane surfaces do add a small amount of friction, the amount of energy lost to friction from the vanes is nothing compared to the energy lost in the impact resulting from the airflow taking an abrupt or significant change in direction. Figures 1.1 and 1.2 below illustrate the airflow resistance that occurs in a 90° square elbow with and without turning vanes. From these figures, it can be seen that the elbow with the turning vanes is 800% more efficient than the same elbow without the vanes. If the owner desires a less expensive installation, the designer may specify radius elbows without turning vanes. A radius elbow without turning vanes is still highly efficient, and is much easier and cheaper to fabricate and install (spatial constraints must also be considered, as a smaller turning radius will decrease efficiency rapidly – minimum recommended turning radius ‘R’ without turning vanes is R=Width/2). 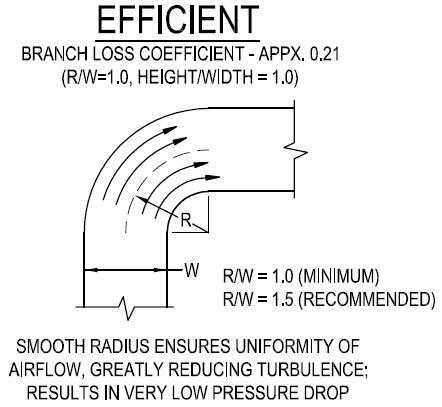 Figure 1.3 below illustrates airflow in a radius elbow. Note also that the radius elbow without turning vanes and having a Radius/Width (R/W) ratio of 1.0 is only 28% less efficient than the elbow with turning vanes. If the radius is increased to R/W=1.5, it will only be 12% less efficient, and if it is increased to R/W=2.0, it will have the same efficiency as the same size elbow with turning vanes! In all cases it can be clearly seen that as the airflow changes direction more gradually, the fitting pressure drop decreases, and with it, the energy required by the system fan to supply the desired airflow volume. There are certain instances where turning vanes can cause an increase in pressure drop, and this article covers two such cases. Case 1: Installation of turning vanes at the entrance to a branch duct. The first case is when turning vanes are installed at the entrance to a duct branch. 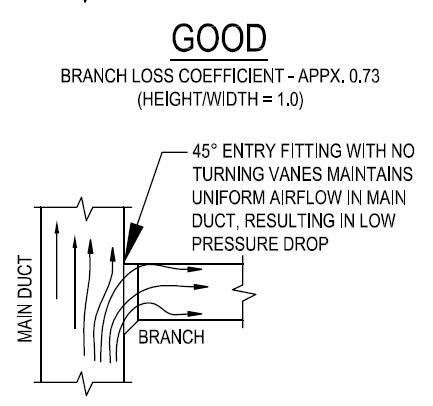 Some contractors, in an honest effort to reduce static pressure, install turning vanes or scoops at the entrance to a duct branch, as shown in Figure 2.1 below. 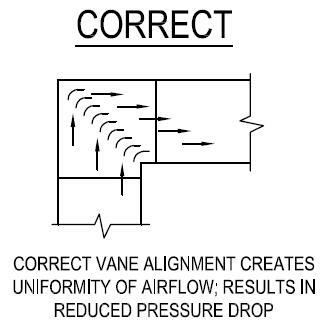 This configuration can cause large pressure losses, because the turning vanes disrupt the uniformity of airflow in the main duct, which in turn causes a high pressure drop at the fitting. 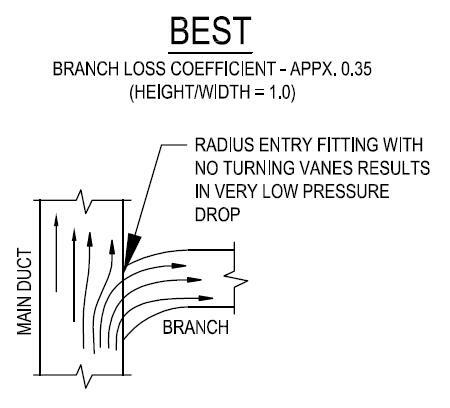 Branches should be installed with a 45° entry or a radius branch fitting, as shown in Figure 2.3 below. Note that the radius branch fitting is twice as efficient as the 45° entry fitting. While the radius branch fitting is slightly more expensive to fabricate, the installation cost is the same as the 45° entry fitting, and can greatly reduce pressure drop in systems with a high fitting count. 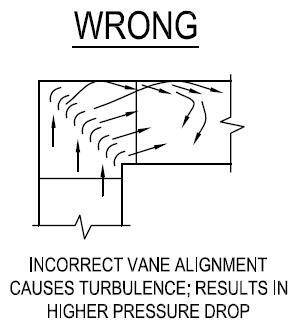 The second example of turning vanes causing a pressure loss is where the vanes are not aligned with the ductwork properly, increasing air turbulence and creating a drop in pressure as seen in Figure 3.1 below. 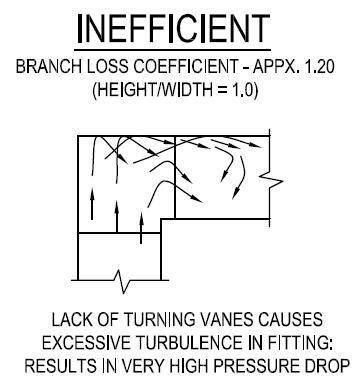 When the turning vanes are not properly aligned to run parallel with the sides of the ductwork at both the entrance and the exit of the vanes, the airflow will impact the sides of the duct and create turbulence. The effects of the improperly aligned turning vanes can range from mild to severe, and are determined by how far out of alignment the vanes are. Improper vane alignment occurs in many cases where ductwork is installed hastily or sloppily, and can be prevented by simply performing a final alignment check on all vanes prior to completing the installation. 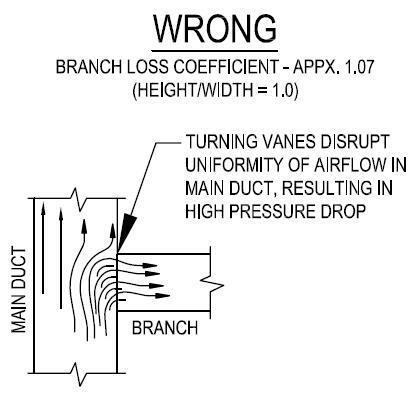 See Figure 3.2 below for an example of airflow in a duct with correctly aligned turning vanes. Turning vanes have been proven to be very valuable for reducing pressure losses and increasing system efficiency. Designers should always specify the highest efficiency fittings possible within the owner’s budget, to increase system efficiency at every available opportunity. Mechanical contractors should never take it upon themselves to add to or remove turning vanes from an engineer’s designs. Each system is designed to a specific total static pressure, and removing or adding turning vanes where they have not been accounted for in the engineer’s calculations will make the system function differently than intended. In a worst case scenario, the changes to the system may cause it to become incapable of supplying the required airflows to all zones. Sheet Metal and Air Conditioning Contractor’s National Association, Inc. (SMACNA). HVAC Duct Construction Standards – Metal and Flexible. Second Edition, 1995. Sheet Metal and Air Conditioning Contractor’s National Association, Inc. (SMACNA): 1998. Print. Air Conditioning Contractors of America. Manual Q – Commercial Low Pressure, Low Velocity Duct System Design. Air Conditioning Contractors of America: 1990. Print. American Society of Heating, Refrigeration, and Air-Conditioning Engineers, Inc. (ASHRAE). 2008 ASHRAE Handbook – HVAC Systems and Equipment. I-P Edition, 2008. American Society of Heating, Refrigeration, and Air-Conditioning Engineers, Inc.: 2008. Print. American Society of Heating, Refrigeration, and Air-Conditioning Engineers, Inc. (ASHRAE). 2009 ASHRAE Handbook – Fundamentals. Inch-Pound Edition, 2009. American Society of Heating, Refrigeration, and Air-Conditioning Engineers, Inc.: 2009. Print. Miles – good post. In my 17 years as a HVAC engineer, I try to use round duct fittings. 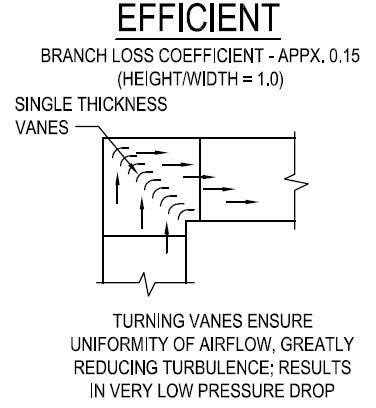 When I need to use turning vanes, I specify Aero Dyne turning vanes because they provide ultra low pressure drop and do not collect dust or lint which is good for IAQ concerns. An excellent illustrated article on turning vanes, thank you. Another huge air flow problem results when evaporators are installed directly on top of Oil furnaces with huge Oil heat exchangers coming all the up to near the top of the furnace. There is NO room for the airflow coming up te outer edges of the furnace to enter the intake of the evaporator without tremendous turbulence & back pressures. There ought to be a lot of articles published about this problem because installers seldom install them at least 6 inches above the Oil furnace, higher is better, with an appropriate transition. I’ve never seen these in a residential system. But I don’t see why they shouldn’t be. RFI I totally agree with your conclusions for supply ducts, but for return ducts I don’t know because it is far easier to pull a chain than to push one. Have you ever seen any study for vanes in returns. Hi Very Good Blog… I would like author to continue on many other topics which will be useful to all. Hi, I’m a HVAC Engineer with over 30 years experience. This article was really useful for me. Really concluded well and informed also. Hello, I am Miftah Habibi, physics student of USU. I like to read this post. Thanks for the post. I want to translate it to my language and make some summary of this post. Then, save it to my book. Hi yes there is in smacna.There is one chart with which you can figure out the numbers of vanes in the desire size but shortly if the redius of the duct is 150 and size is 300 mm in the night then no need I mean to say if you take the radius of the elbow and you make double and then it is coming equal to the size then we don’t need vane there. For exhaust only ducts there is way more to this than this article discusses. And the higher the pressure/velocity the greater the losses in the turning vane. At some point the multiple vanes create more turbulence than a basic elbow. Pulling the air calls for the inside radius to be a bigger part of the change in direction so a large radius elbow could be far more efficient than multiple vanes but there is no test data to compare this for certain. I wanted to say that we’ve looked at this overview of turning vanes as a necessary component dozens of times over the years and appreciate the information included. For us quite often, we point our clients toward this post as it represents an independent, third-party look at the positive impact of turning vanes within commercial systems. Thanks for posting! I would like to know the repercussions of just using every other vane. Double vanes get extremely heavy on larger ducts. Are the vane rails engineered for optimal airflow? Yes they are optimized. Do not change spacing or create large losses. SMACNA has tested turning vanes and found them very inefficient. I do not put in square elbows in any situation. If we have better control on fitting’s fabrication then only go for turning vanes (Figure 2) otherwise you may result in to higher pressure drop. If fabrication quality is average or below average then go for elbows of R=1.5W if space permits otherwise go for R=W. If you have plenty of space then go for R=2W. Elbow of R=2W may be costly solution considering space and material. For large size elbows supporting could be an issue for R=2W elbows. can vanes cause increase in noise?